Incredibly, bobcat Morgan was found at a Ritz Carlton Hotel in San Diego, CA. A worker brought her across the border as a baby and, when they found out how hard it was to care for a bobcat, they left her in one of the hotel rooms! She was rescued by the California Wildlife Center in hopes that she could be rehabbed and released back into the wild. But DNA tests couldn’t confirm that she was indeed a wild-born bobcat. The California Wildlife Center began the search for a permanent home where Morgan could be with her own kind. 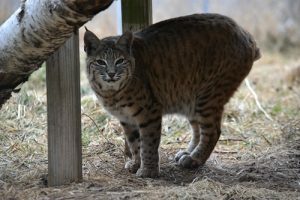 Actress Morgan Fairchild stepped in to help this little bobcat.. She reached out to some of her contacts and was able to assist in finding a new home for her here at The Wildcat Sanctuary. Morgan arrived in 2007. Since Morgan Fairchild was instrumental in this bobcat’s placement, it seemed fitting to name her Morgan. Morgan Fairchild has her story still featured on her Activism web page. Once Morgan arrived, she began living with Shalico, a young Canada lynx, and two other lynx. She quickly became attracted to Shalico. When he ate, she ate. When he napped, she napped. When he played, she played. Ever since that day, she’s been glued to his hip! She enjoys rolling in scents, cuddling with Shalico, and eating freeze dried cat treats. Especially fish! Would you consider joining our family of sponsor parents by sponsoring Morgan? Your support would be greatly appreciated.